The simple solution is often the best. That means an e-procurement system driven by ‘simple’ is delivering the best solution for its customers. That’s the foundation on which we’ve built Procurehere. Since 2002 we’ve been delivering outstanding e-procurement solutions to customers throughout Malaysia. In 2017 we took that evolution towards simple on to the next level, with the release of Procurehere Version 7.0. We asked ourselves – if we’ve got a platform that delivers simple solutions to our customers, what’s the simplest solution to expand that opportunity? The answer for us was clear – we make it more accessible. So Procurehere took the exciting leap to the cloud, ensuring the user-friendly opportunities of Procurehere were accessible, anytime, anywhere. We’re proud of our user-friendly platform, and the power of simple procurement solutions, but what’s the real value of simple? Complicated systems may look impressive, yet complicated is often a barrier to an effective business system. We’re always looking to simplify business processes to make them more efficient, and the same should be true of our e-procurement system. So what difference can a simple solution make? 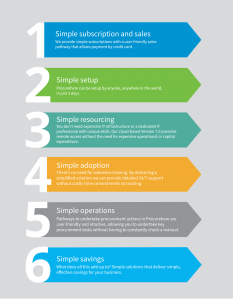 Want to explore the opportunity to unlock savings with simple procurement for your business? Get in touch with Procurehere today.